Whether Adrienne brings her classic carved gilded concert harp or her black contemporary electric harp, your event will be enhanced not only by the elegant appearance of the harp, but also by its lyric tones and her beautiful voice. With an extensive classical and contemporary repertoire, Adrienne Bridgewater's music will make your special occasion a memorable one. From surprise birthday parties and wedding anniversary celebrations to holiday revelries or a romantic dinner party for two, Adrienne's vibrant music will help create your special event. Highly entertaining or simply background bliss, Adrienne's harp and voice will set your company's occasion apart from the usual. 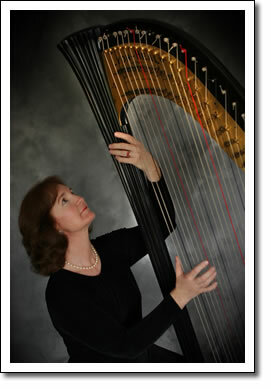 Both entertaining and uplifting, Adrienne's engaging stories and harp lore contribute as much as her music to the audiences enjoyment. Music while family and friends gather sets a mood for remembering and celebrating the life of a loved one. A musical solo or interlude during the service allows time to feel the depth and breadth of emotion and support during this important life commemoration.